It’s a bit of a dicey time to be launching a new battle royale game, but Egress may just have enough new ideas for the genre to make it stand out. The Lovecraft-themed battle royale will hold an open beta starting August 1st, so players will have a chance to see for themselves whether the dark Victorian setting and Souls-style combat create something distinctive. Egress pulls from a dizzying array of source material. While the setting is reminiscent of Industrial Revolution-era London, the neon signs and tattooed martial artists suggest a healthy infusion of cyberpunk. A new alpha gameplay trailer (which you can watch below) shows a new spin on the changing playspace of battle royale – here, it’s a rising water level that changes the arena, rather than a contracting death circle. We’ve done extensive testing and chicken dinner-tasting to create this list of the best battle royale games on PC. The combat looks heavily melee-focused, and developers Fazan have said explicitly that they’re going for a Souls-like fighting system. You get to see a bit more of that in the alpha gameplay footage they’ve provided, below. There are ranged attacks, but they’re heavily telegraphed and slow to balance them for use one-on-one melee duels. Without further ado, here is the alpha footage. You get a sense of the tighter spaces Egress is focused on here, but the environment isn’t completely urban. The closed beta announcement video highlights some wooded areas, perhaps high up in Egress’ tiered world. Plus, there is a man who is also a clam. You can sign up for the beta and Egress newsletter at the official site, and there’s a Steam page up as well. 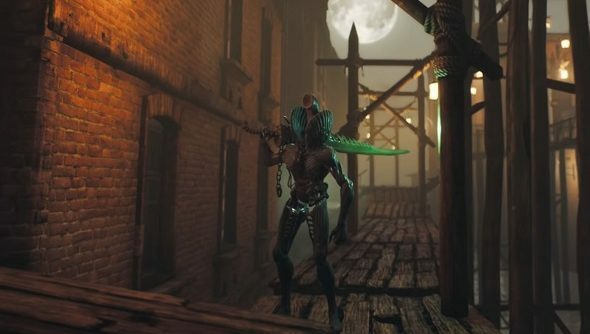 Fazan says Egress will be out for PC, Xbox One, and PlayStation 4 later this year.